The US House of Representatives and Senate introduced separate proposals to overhaul tax law last month, but with an unpredictable legislative process ahead, which will see the upper and lower chambers battling it out for consensus, the final version of the bill was not yet published as we went to press. 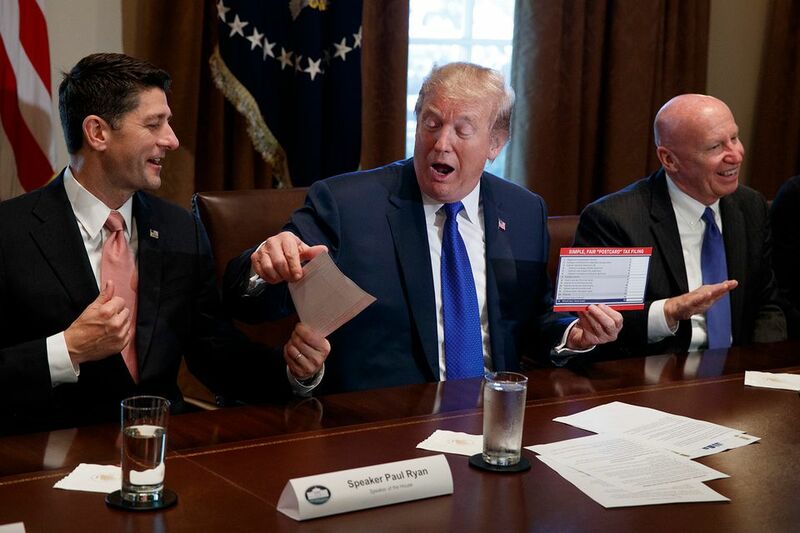 In keeping with Republican promises, both bills would cut corporate income tax rates from 35% to 20% and reduce or eventually repeal the estate tax, among other changes. Here, we analyse how some of the proposed reforms to US tax legislation could impact the art world. A big worry for art museums would be a possible change in the charitable income tax deduction, which “could become almost impossible for people to use”, says Andrew Finch, the director of policy at the Association of Art Museum Directors. Under the current rules, taxpayers can subtract the year’s charitable gifts from their income, reducing the amount of earnings that are subject to tax. President Trump’s proposal for a higher “standard deduction”, adopted by both the House and Senate bills, could mean that many taxpayers who currently deduct charitable gifts will no longer be able to do so, which could reduce the tax incentive for donating art and money to museums. While museum donors probably will not stop giving as a result, they may give less, Finch says. Museums could also be affected if Congress repeals or significantly reduces the federal estate tax, which President Trump has promised. Currently, art gifts to a museum by a donor who has died yield a tax benefit for heirs, because the charitable deduction removes the art from the estate tax. Some observers argue that repeal of the estate tax will reduce the amount of art or even cash gifts at death. Ageing art collectors face a key question: if their children do not want or are unable to care for the art they may inherit, should the parents sell it or keep it? Tax law changes may sway the decision. Under current law, US collectors who bought art that later went up in value often postpone a sale until death to avoid the current federal tax of 28% on the gain from sales of collectables, Levin says. If the art is instead held until their death, the art’s tax basis, or cost, is “stepped up” to the then market value—eliminating any taxable gain when the heirs sell the art. But, federal estate tax, which is currently payable at a rate of 45% on estates that are worth more than $5.49m, is currently imposed at death, which encourages many heirs to sell art to help pay the tax. “A significant provision” in both the proposed House and Senate bills is the elimination of the “like-kind exchange” rule for art, which would affect art investors, says Stuart Gross, a tax lawyer at Roberts and Holland in New York. Currently, those holding art for investment can sell and buy art and defer paying a capital gains tax on the sale if the sale and purchase transactions qualify under current rules, which stipulate that what is bought and sold must be fundamentally alike (in other words, money made from the sale of art needs to be invested in more art). But under the new proposals, this like-for-like exchange would be eliminated, except for property, which may lead to greatly reduced spending on art by those who buy it as an investment. In addition, corporations are “giving less to the arts” now anyway, Kaiser says. Previously, smaller companies that were at least partly owned by local residents often enhanced their marketing efforts with gifts that associated them with particular art institutions or endeavours, or made “good corporate citizen” gifts that local museums could depend on annually for operating expenses. Now, large corporations face increasing pressures from shareholders located across the country to improve their bottom lines and cut costs, which means “less incentive for corporations to do this kind of community giving” to the arts. For the same reasons, he says, “increasingly, corporate giving is available only to the largest and most visible museums” and other arts organisations such as opera companies. An exception, he says, was the $5m gift in 2011 by the H-E-B supermarket chain in San Antonio to help create the Tobin Center for the Performing Arts. Both the House and Senate bills would eliminate or sharply cut the deduction for state and local income and property taxes, a benefit which currently lets many salaried Americans pay less tax. Cutting the tax break would mean those taxpayers could see their disposable incomes drop. Would they be less likely to pay for higher levels of museum membership, or a ticket to a museum gala, as a result?